In the current subprime mortgage crisis, women and minorities are losing their homes at a disproportionate rate, disrupting their circumstances and daily lives. But foreclosures also have a significant impact on wealth building and long-term prospects. Without a home, women and people of color can't build equity, they have no safety net, they have limited access to loans for their children's tuition and fees, and they have nothing to pass on to the next generation. The following is adapted from the Applied Research Center's May 2009 report, "Race and Recession: How Inequity Rigged the Economy and How to Change the Rules." Sandra Hines, lost her family home to foreclosure. Her story, combined with the stories of millions of other people who have recently lost their homes and most of their assets, represents the latest chapter in a long-standing and intensifying racial, gender and wealth divide. Sandra Hines, a 55-year-old Black woman with a deep, commanding voice, remembers the day last year when her neighbors called to say that the sheriff’s deputies had arrived at her family’s Detroit home. "Our foreclosure was very brutal," said Hines, who had moved into the house with her parents and two younger sisters at age 18. "They busted up my mother’s antique furniture, our belongings that we had accumulated for 40 years." The sheriff padlocked the door, and the Hines family was evicted. "We lost the home our parents bought," she said. "Now we’ve lost all of it." When Hines’s middle sister lost her job at General Motors last year, "the family fell on hard times, and we refinanced the house," said Hines. "But we had one of those ARMs [adjustable rate mortgages], and the payment almost doubled. My sister wasn’t able to keep it up." They received a notice informing them of their pending foreclosure. After their eviction, Hines’s two sisters and her teenage niece moved into a rental. But shortly after, their landlord defaulted on his mortgage, and that house went into foreclosure, too. "We are facing double foreclosure," she said. Stories like these have become all too common during this brutal economic recession. But what is less obvious is how the crisis threatens to have long-lasting, multi-generational consequences, and severely impacts the ability of poor people and other marginalized groups to earn money and generate savings. The economic crisis has reversed a significant gain in home ownership among communities of color and women over the past decade. These groups in particular have suffered devastating losses in homeownership--the principal source of wealth for both groups. For many families, home ownership is the foundation of equity and wealth to pass on to future generations. As foreclosures displace families and destabilize neighborhoods, this foundation is broken. Losing a home also means being uprooted in a traumatic fashion. In March 2009 alone, over 340,000 homes went into foreclosure, a 46% increase from March 2008 (1). Multiple foreclosures have a deep impact on neighborhoods and communities. Home loss has not only resulted in more vacancies but also other negative impacts such as increased crime, businesses leaving the community, unpaid property taxes and declining neighborhood home values (2). But the most damaging and lasting consequence of foreclosure is that families are stripped of their carefully and laboriously accumulated wealth. Indeed, homeownership is the central vehicle of wealth building for almost all families in the United States. "We lost our foundation as a family," said Hines. "I want to know what happened to the American dream? It’s an American nightmare, and it’s two or three nightmares if you are African American." For those who have long owned their homes, foreclosure means a loss of stability because for many families, their home was their only asset. While many subprime loans are sold to new homebuyers, in 2006, 56% of subprime loans were refinancing loans(3). They were sold to families like the Hineses, who already had equity in their homes. Amaad Rivera, of United for a Fair Economy, a Boston-based advocacy organization, estimates that the loss of wealth in communities of color resulting from recent foreclosures will be greater than since before Reconstruction (4). Indeed, the foreclosure crisis has brought Black and Latino homeownership rates back to where they were before the homeownership boom of the past decade--when they were already lagging significantly behind that of whites. Women already hold fewer assets than men, and families of color already hold far fewer assets than white families, whether measured by the comparative value of cars and homes to retirement accounts. "Even widowed women, who fare best of all non-married women, own only $0.59 for every dollar of wealth owned by widowed men," writes geographer Karuna Jagger of the Women’s Health Initiative for Self-Employment. Citing data from 2006-2008, Jagger identifies never-married women as having astonishingly low levels of wealth, "less than a quarter of the wealth owned by never-married men. Never-married women’s median net worth is just $2,500 compared to the $148,700 median net worth of married individuals" (5). According to economist Ed Woolf, in 2004, for every dollar in median wealth that white families possessed, Blacks had a dime and Latinos a nickel (see Figure 1). The disparities are even more glaring when families lose their homes. Subtracting home equity from the equation, Blacks have a penny and Latino families even less than a penny for every dollar of non-home wealth possessed by whites (see Figure 1). Even during the housing boom, the racial wealth gap was widening (see Figure 2). Now, because the foreclosures have hit people of color the hardest, the racial wealth divide is certain to grow. For households of color who aspire to homeownership, the impact will reverberate far beyond the immediate crisis. Wilhelmina Leigh of the Joint Center for Political and Economic Studies observes that this will likely mean not only a period of lessened wealth, but "a period perhaps of lessened creativity [for Black families] ... For people who are just starting out, a home is a visible sign of moving forward ... It’s those visible signs and visible statements that can make a difference to a group of people who have not historically had opportunities to move forward." Foreclosures drain communities of not only equity but also self-confidence, according to Leigh. "Here there were people trying to do well and move forward, and they get kicked in the teeth." According to a survey conducted by the Joint Center for Political and Economic Studies, African American women (58%) and men (53%) reported roughly equal homeownership rates in late 2005, but the women (69%) were much more likely than men (52%) to be first-time homeowners (6). The long-term effect is crippling as many women (and families of color in particular) will have less to pass on to their children, and will therefore have less stability and opportunity to get ahead. Many families who would have used their home equity to help pay for retirement or college tuition, for example, will no longer have that option. According to Philip Day, president of the National Association of Student Financial Aid Administrators, "With so many people up against the wall with declining home values, the issue of using home equity loans for tuition is almost rendered moot" (7). As a whole, the current economic crisis promises to have long-lasting negative consequences for wealth equity in the United States unless policy solutions are designed and adopted to reverse the trends. Women like Sandra Hines are speaking out, organizing, and fighting back with groups such as the Moratorium Now! Coalition in Detroit. But if the current and coming generations of women and people of color are to have any collective hope of wealth equity, we must demand an end to foreclosures, increased access to fair terms of credit, and a closing of the persistent wage gap. 1. 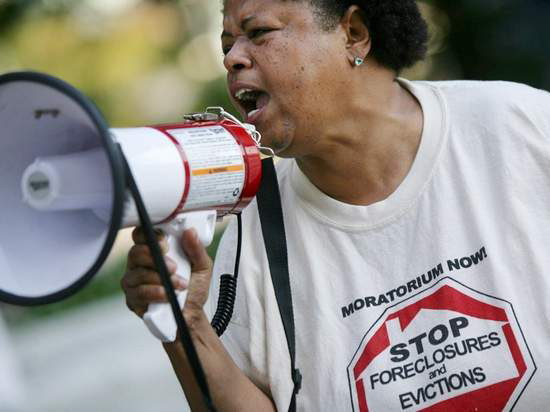 National Community Reinvestment Coalition, "Massive Foreclosures Continue to Fuel Recession (Central Cause of Credit Market and Economic Woes Gains Momentum)," April 16, 2009. 2. Christy Rogers, "Subprime Loans, Foreclosure, and the Credit Crisis (What Happened and Why? - A Primer)," The Kirwan Institute, December, 2008. 4. Amaad Rivera et al., "Foreclosed: State of the Dream 2008" (Boston: United For a Fair Economy January 15, 2008). See also R. Kochlar et al., "Through Boom and Bust: Minorities, Immigrants and Homeownership," Pew Hispanic Center, May, 12, 2009. 5. Jaggar, Karuna. "The Race and Gender Wealth Gap." The Race, Poverty Environment: a Journal for Social and Environmental Justice (Fall 2008): n. pag. LexisNexis Academic. Web. 5 Oct. 2009. 6. Leigh, Wilhelmina, and Danielle Huff, eds. Social Security and Wealth: Fact Sheet About African American Women. N. pag. Insight Center for Community Economic Development. The Joint Center for Political and Economic Studies, 2006. Web. 5 Oct. 2009. 7. Bob Tedeschi, "College Tuition Not on the House," New York Times, April 3, 2009.